is the third facility to have detected a fast radio burst. 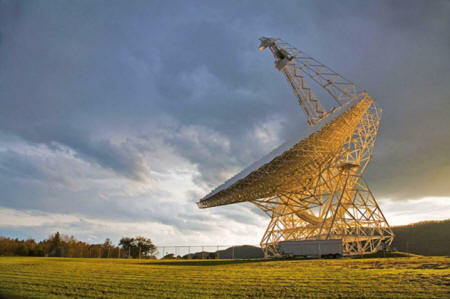 detects clue to source of fast radio bursts. For the past eight years, astronomers have been mystified by sudden, very short blasts of radio waves that defy explanation. Now the most detailed study so far 1 has furnished a clue to the origin of at least one of these strange pulses, or 'fast radio bursts' (FRBs). It came from a dense, magnetized region of space, and was probably emitted by a young neutron star (a compact core left in the aftermath of a supernova), says study author Kiyoshi Masui at the University of British Columbia in Canada. When the bursts, which last just a few thousandths of a second, were first discovered 2 in 2007 using the Parkes Observatory radio telescope in New South Wales, Australia, skeptics put them down to an instrument fault or interference. Masui and his colleagues found the latest example using the Green Bank Hydrogen Telescope in West Virginia, the third facility to observe the strange phenomenon. The results are published on Nature's website today (Dense Magnetized Plasma Associated with a Fast Radio Burst). The extremely bright radio pulses are mysterious because they don't coincide with known astronomical events, and appear from seemingly random directions in the sky. No single burst has been seen to repeat. Masui and his colleagues found the pulse by scouring through 650 hours of archived data using a specially designed algorithm. This took into account how such a radio signal would appear on Earth after smearing out as it travelled through space. They suggest that the burst (named FRB 110523 for the date of its original detection, 23 May 2011) came from as far as six billion light years away - about halfway across the Universe. Because the telescope receives signals from large patches of sky at any one moment, it cannot pinpoint which particular galaxy the FRB came from. Astronomers already knew that FRBs come from sources that are small - no more than a few hundred kilometers across - and very bright. Unlike most previous studies, the Green Bank data also revealed the polarization of the incoming light. The team saw a spiral pattern, which suggested that the waves had travelled through a magnetized region of space. They also found that the light had been scattered early in its journey. That pointed to it emerging from a dense cloud of plasma. A plasma-filled region suggests an area of space where stars are still forming. Combined with the magnetic field, Masui says that this could mean that the FRB came from a starquake - a disturbance in a star's crust, similar to an earthquake - in a young magnetar, a strongly magnetized neutron star. The team's findings argue against the burst being caused by events involving mature stellar objects, such as colliding white dwarfs or older neutron stars. These explanations, previously put forward to explain FRBs, tend to happen in open space, says Masui. The case for the burst being a young neutron star or magnetar is "tantalizing", says Duncan Lorimer, an astronomer at West Virginia University in Morgantown, who was part of the team that spotted the first FRB. "It's only statistics of one object at present. This needs to be borne out by further discoveries." All the attributes of the burst match the expected behavior for a cosmic rather than terrestrial event, says Matthew Bailes, an astronomer at Swinburne University of Technology in Melbourne, Australia. "If FRBs are some bizarre form of man-made interference, that is a truly astonishing coincidence," he says. Although the findings are likely to sway opinion on what is causing these cosmic bursts, a definitive answer will only come from new instruments that can detect thousands of such events, says Victoria Kaspi, an astrophysicist at McGill University in Montreal, Canada. The Canadian Hydrogen Intensity Mapping Experiment (CHIME) near Penticton, British Columbia, which opens next year and will scan more than half of the sky each day in the correct frequency band for radio bursts, should be able to detect tens of FRBs per day, she adds.